New Haven's John Lugo was one of the protesters that blocked off the entrance to the Abraham A. Ribicoff Federal Building and Courthouse in Hartford Friday November 30 in support of Nelson Pinos, a man currently in sanctuary. They formed a line in front of the building in a protest held in honor of Nelson Pinos, who came to the U.S. from Ecuador in 1992. Some of them were actually wearing chains as they sat with their backs to the glass doors of the building. “We’re showing that Nelson has all our support and we will do whatever we need to do to convince the authorities to give him the freedom to go back to his house,” said John Lugo, who’s right hand was chained to a barrel. That barrel was weighed down -- filled with bricks and cement. The protest was held on the one-year anniversary of Pinos going into sanctuary in a New Haven church. He left his home and family last year after ICE attempted to enforce an existing removal order. The goal of the protest was to shut down operations at the building, similar to a July event where 35 people were arrested at the same location. 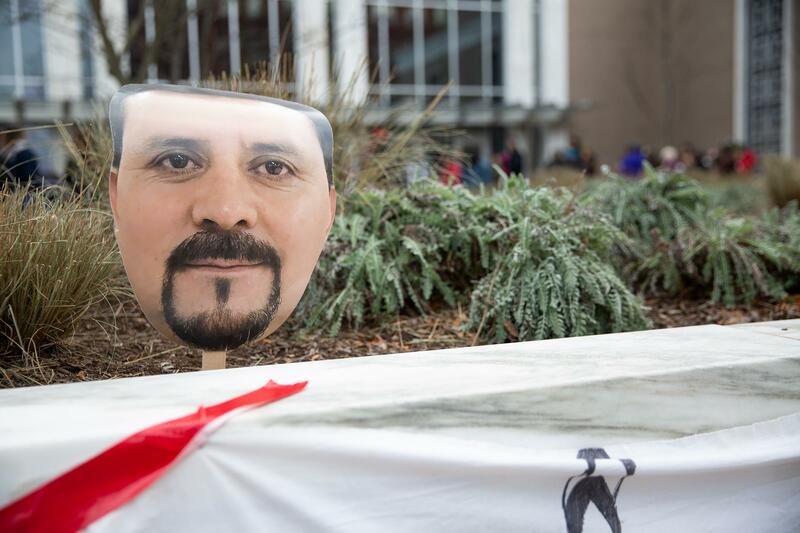 A stick featuring a picture of Nelson Pinos' face was present at the rally in Hartford on November 30 as a way to represent him as Pinos couldn't make it due to being in sanctuary in a New Haven church. Alok Bhaat -- unchained -- sat next to Lugo. He’s a member of the Connecticut Immigrant Rights Alliance. He said that ICE’s actions warranted a more hard-lined response. Attorneys for Pinos recently asked ICE to grant him a stay of deportation. They cited the mental toll the separation was having on his family in their reasoning. The request was denied. Pinos remains in sanctuary and his attorneys have been told that there’s no way to appeal. As attorneys continue to plead for a stay of deportation for an Ecuadorian man currently in sanctuary in Connecticut, his family spoke out Wednesday on his behalf. They stood outside of the federal building in Hartford which houses a local office of Immigration and Customs Enforcement.